A lot of happy childhood memories stemmed from the smell of my dear mom baking something in our kitchen. She made almost everything from scratch–bread, cinnamon rolls, pizza, jams, even toothpaste (but that was only once because, well, homemade toothpaste is disgusting). I’m sure that I got my love for cooking and baking from her (thanks for letting me make all those messes in the kitchen mom! ), and I still make a lot of what we eat from scratch. There are getting to be more and more great-tasting gluten-free products out there, but my homemade bread recipe (made with my homemade flour mix) is still our favorite. 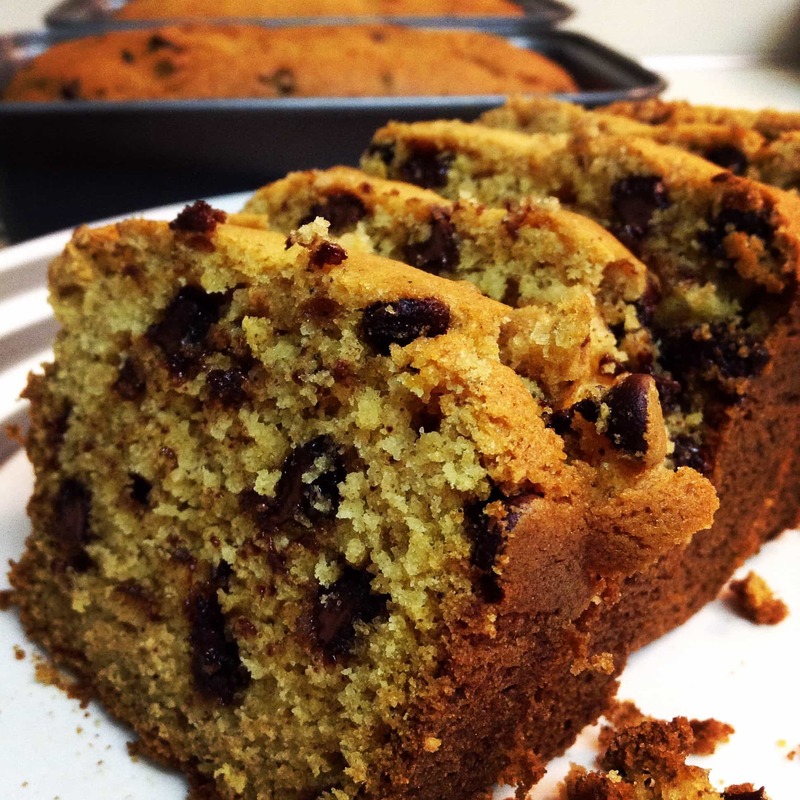 Every year when the air gets crisp and leaves begin to change colors and fall off the trees, I get a hankering for my mom’s famous chocolate chip pumpkin bread. I love all things pumpkin, so I have tried many a pumpkin bread (homemade and commercial) and none have measured up to this recipe. Naturally, when my husband was diagnosed with food allergies, this was one of the first recipes I converted to gluten-free, and I think you will come to love it too. Maybe it will become a family tradition for you, too. I have had the best results using my flour blend. You might be surprised how different a recipe can turn out depending on what flour you use-so if you can, hop on over to my recipe and whip some up. If not, I would suggest Cup4Cup or Gluten Free Mama’s almond flour blend. You can use either canned pumpkin, or fresh pumpkin puree. If using fresh pumpkin, be sure the liquid has been strained out so it is as thick as canned pumpkin would be. I love cinnamon, so that is what this recipe features. If you like other spices (ginger, cloves), feel free to substitute equal amounts for some of the cinnamon. I wouldn’t use any more than 1/4 tsp of each kind, though. Add 1 1/2 tsp xanthan gum if your flour mix doesn’t already have some. Combine sugars, pumpkin, oil, eggs, and water in KitchenAid or large bowl and mix with paddle attachment or beaters until thoroughly combined. Add flour, baking soda, baking powder, salt, cinnamon, and allspice and mix for 2 minutes. Because flour mixes and moisture levels of the home vary, add a T of water if it looks too thick, adding more if needed to reach the desired consistency. If too thin, Add a tablespoon or two of flour mix. Mix or stir in chocolate chips and nuts, if using. Preheat oven to 350° and let batter sit while it is preheating. This eliminates any gritty texture. Generously grease 6 mini loaf pans, or one large loaf pan. Pour/spread batter into pans and bake just until toothpick comes out clean gluten-free baked goods call for extra attention because if they are slightly overcooked, they might be crumbly or dry. Mini loaves begin checking at 15 minutes, checking every 2 minutes after if not done. large loaf pan, check at 50 minutes, checking every 3-5 minutes after if not done. Hello! Just ran across your website for the first time, and while I’m actually leaning toward going grain-free (using almond and coconut flours only) bc of serious medical issues from gluten, your bread recipe caught my eye on Pinterest (and, yes, I pinned it!) 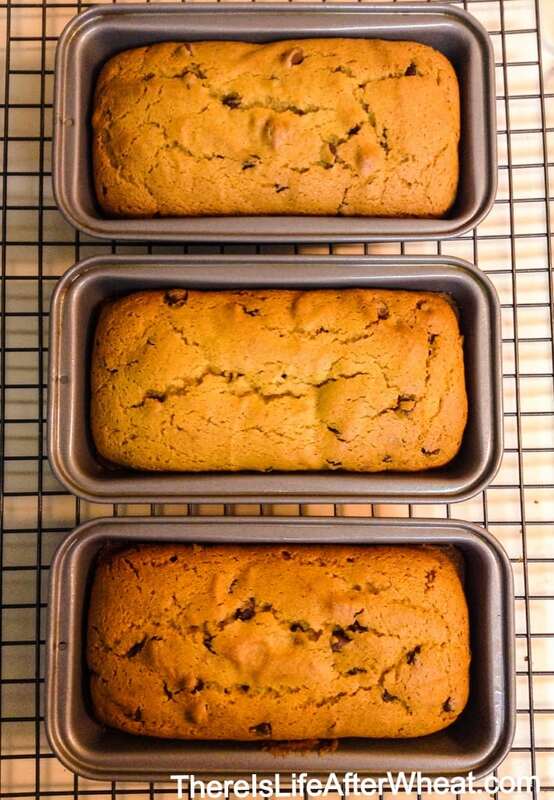 Then I found my way to your Pumpkin Bread recipe — oh, boy, do I sure miss my old gluten pumpkin bread!!! Wow, no chocolate is a bummer! But there are so many other things that make dishes like this taste so good. I’ve omitted the chocolate and think it tastes great either way. Walnuts would be a great addition, too! If you can tolerate ice cream, we love freezing and then thinly slicing mini loaves and using it for ice cream sandwiches, perfect for this time of year. Thanks for stopping by Jean! I’m sure you could Cris. Thanks for stopping by! As in wheat flour? hmmm it’s been a long time since I’ve cooked that way 🙂 you would omit the xanthan gum, and decrease the baking soda and powder, maybe to 3/4 tsp each. Hope it works out for you! This was super gooey. even after cooking and re-cooking. The ends were done, but the middle remained goo. I was very disappointed. Hi Renee! I’m so sorry it didn’t turn out, what flour did you use?